Small houses can be charming, but there are definitely challenges to working with a tight space. 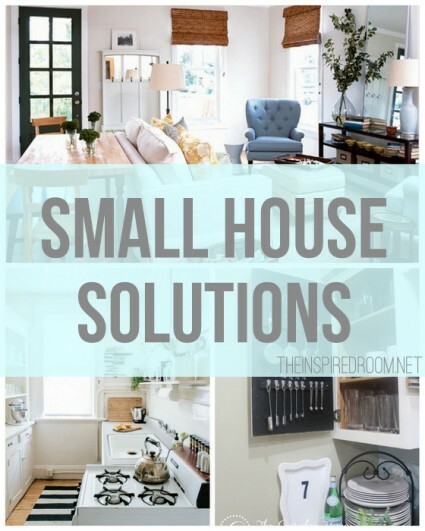 Here are five common small house woes, and a few solutions for each! Adding a horizontal striped rug visually widens a narrow space. 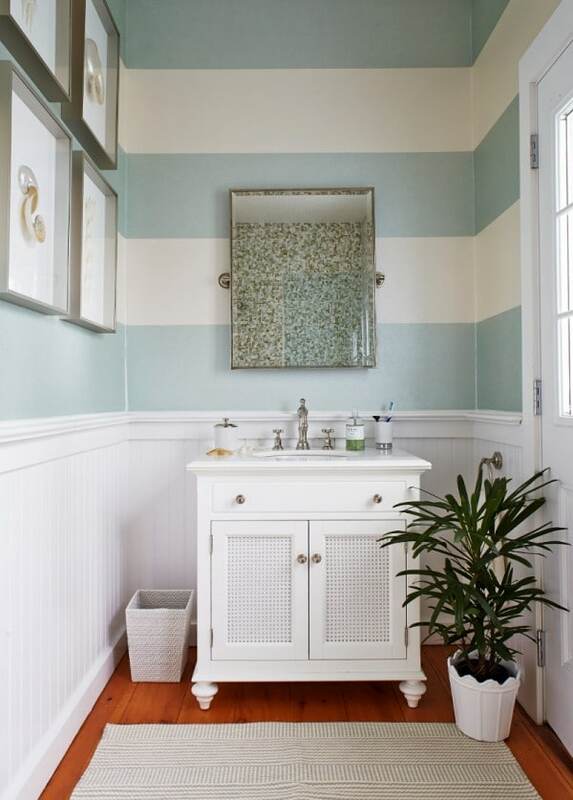 And painting horizontal stripes on the walls has the same effect! Low ceilings? Switch to vertical stripes! 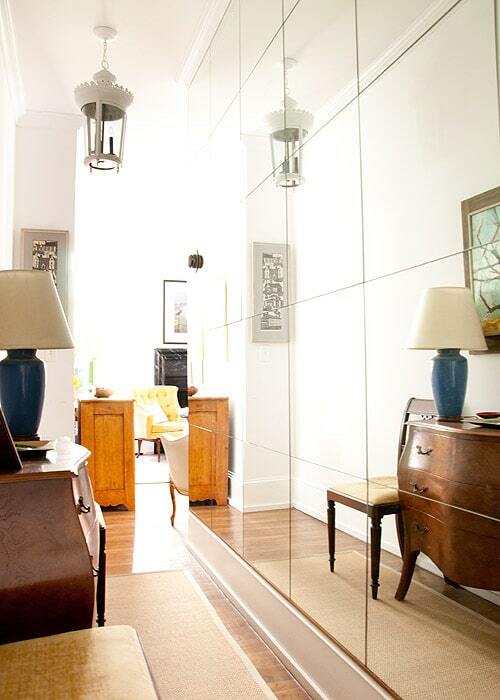 A full wall of mirrors in this narrow space doubles the visual impact of the hallway, making it feel more spacious. 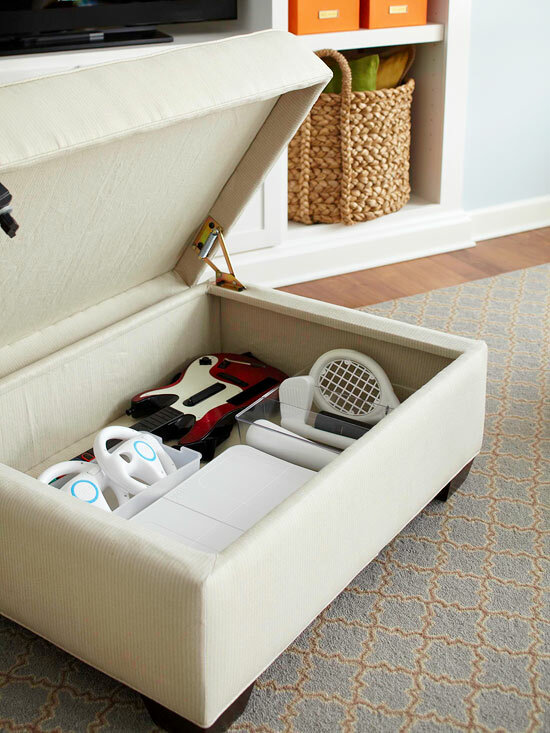 Find storage in unexpected places. This cupboard door is perfect for added storage and keeping kitchen tools easily accessible. 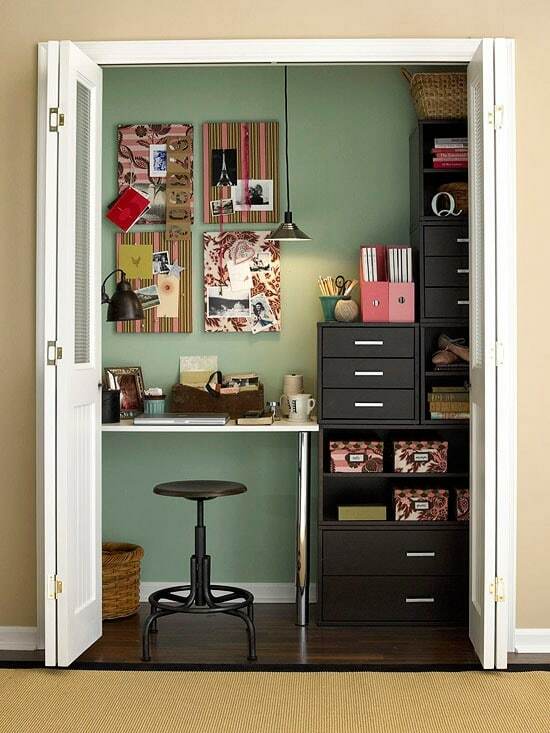 Take over an underutilized closet and transform it into a small office. No designated dining room or entry? This space manages to accommodate a living room, entryway with coat hooks, and even a small dining table against the sofa! Don’t be afraid to make unconventional choices if they solve your space limitations. 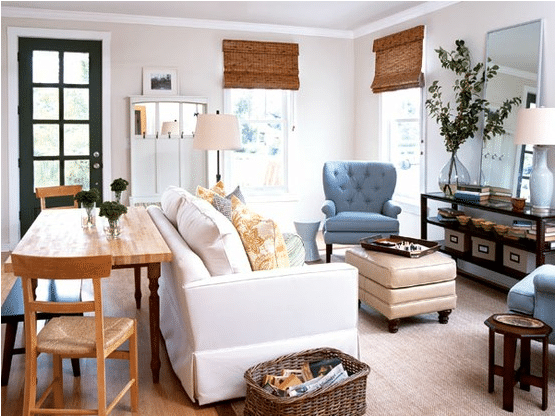 Consider furniture that looks airy and open. 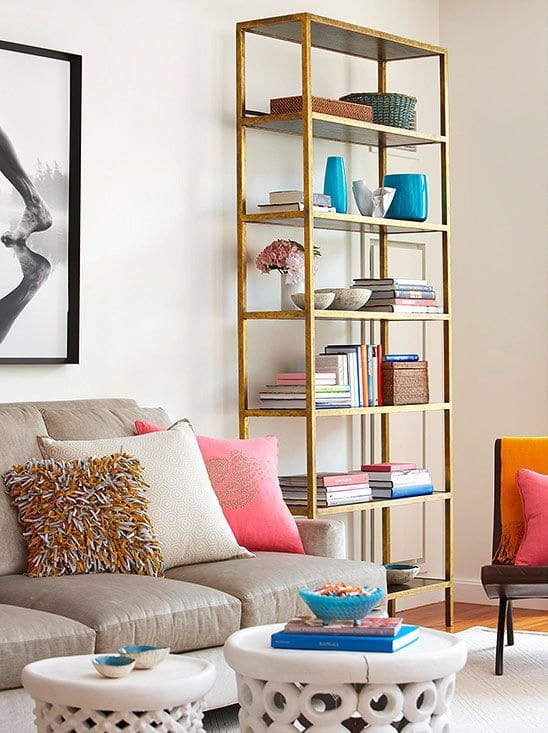 This pretty gold bookshelf has an open back, and the occasional chair has exposed legs which lets our eyes pass right through instead of taking up a lot of visual space. Choose built-ins. Too many pieces of furniture in a small room will make it feel cramped. Be sure to use multiple layers of lighting. This room uses a ceiling pendant and two sconces in addition to their large window. In a living room, you may have the option to use recessed lights, a ceiling flushmount, and even a few table lamps to bring in extra brightness and ambiance to your space. Strategically placing a mirror on a wall opposite from a window maximizes natural light and creates the feel of an extra window. What other tricks do you use for small spaces? Some affiliate links used, thank you! What a great post about tricks to visually expand a small space, and so beautifully illustrated by the photos! Another tip is using a high light reflectance value (LRV) paint on the walls. The mirror trick is great! It might sound odd, but sometimes one big statement piece of art on a wall makes the whole room look bigger. 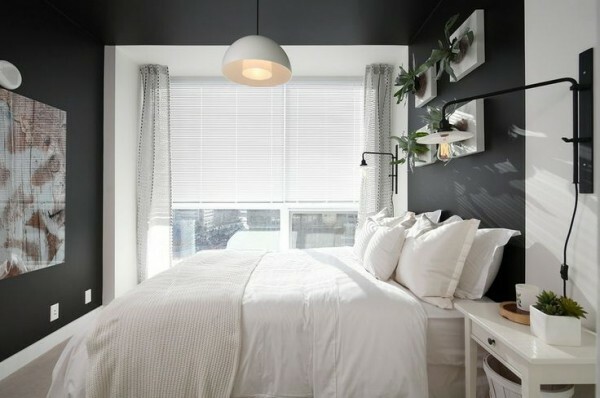 I enjoyed the tips in this post for making a small room feel larger. I also voted for you because I have learned so much about design and placement of items in my own home and I really look forward to your posts every morning. I also do see your Facebook posts because I liked the page several months ago. Thanks Melissa for the great tips for small spaces. I love the gold open bookcase and would love one for my condo. Do you know where I can get one? Thank you so much. Sometimes you need to be reminded of things you already know and this article was great at removing the roadblocks to visually having more space in all of my apartment rooms. 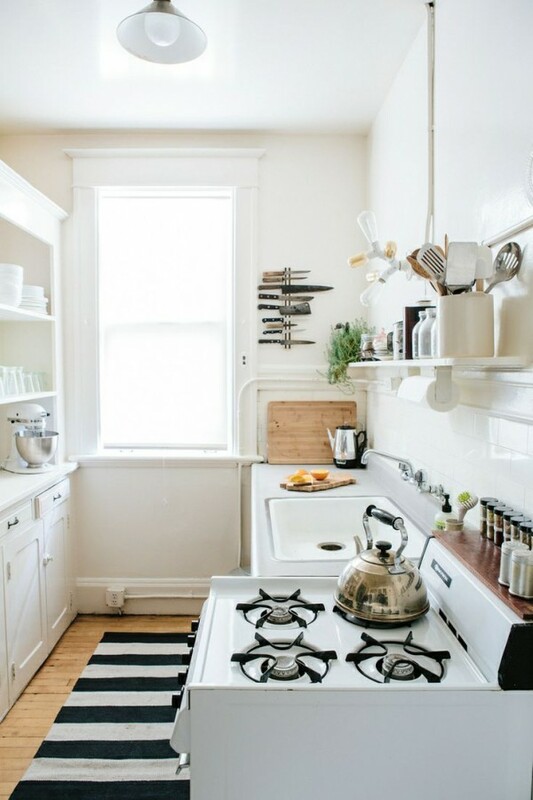 I loved the chalkboard storage in the kitchen and the striped rug and the bedroom lighting. I love your blog and will be going to cast my vote next. Good luck and thanks again. Love these suggestions! With five kids, it seems there are never enough rooms! We do double and even triple duty in a lot of spaces! All excellent ideas — except a wall o’ mirrors would bug me. When one is me, one likes to pretend one is more beautiful than one is! Great ideas! I have an open concept living/dining space so it can easily become crowded. I’m contemplating built ins. Anywho, thanks for this post! Great ideas. I use that last trick in my bedroom which has only one window. I have a mirror on the opposite wall and it really does brighten that room. I love the idea of turning a closet into a work space, such a creative and useful idea!Thanks for sharing, these tips are great for apartment living! I like the measuring cup and spoons trick. That would save a lot of room in my cramped drawers. Thanks! I moved into a small home about 6 months ago and I still have no idea how to decorate it! This helps SO much. great post. I love the striped bath and the mirrored hallway. Mirrors in a small space are key! Love these photos! I pinned them to my skinny house board for my kids to see. They have a skinny row house they are remodeling. Perfect inspiration. Such awesome ideas! In small spaces, I think that pulling furniture out from the wall makes the room seem larger. And I love built-ins…it’s perfect for stage without taking up so much visual space. Love the useful tips on small home living. 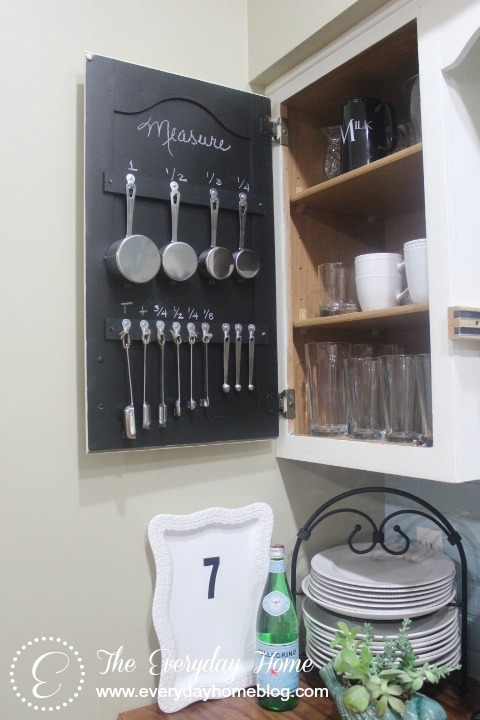 The measuring cup cabinet is so creative! Melissa, AMAZING POST. One of my favorites ever. Great ideas for cozy area, every home seller should see! Sometimes it’s not about the size of the room, it’s what you do with it! Great ideas for me to help with staging! Great tips, I also found that with a rectangle rug, your instinct is to put it in alignment with the room but if you put it the other way it visually widens the space. What a great post. I love the mirror and the built ins. I think the knifes on the wall were a little scary though in the first picture of the kitchen. Very Halloween/scary. Some of these ideas I have heard and use, but the wall of mirrors is an OCD’s nightmare…I would be winding all day(especially with little kids). And the dining table against the back of the sofa? Unless it’s specifically a game table, that has MESS written all over it! Pretty photos, but not all practical.